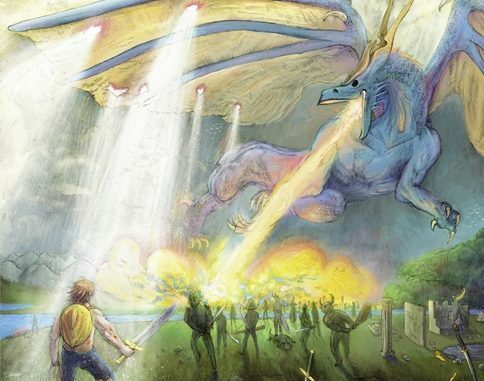 Prolific Indie band The Mountain Goats is releasing their 17th release, “In League with Dragons” on April 26th. The Mountain Goats founder, lead singer, songwriter, guitarist, John Darnielle has always been the nexus and driving force for the venture. The new release marks 28 years since Darnielle first emerged on the musical world with his quirky and unique view of reality along with the band that has formed under his leadership. In a number of ways “In League with Dragons” reflects the long path the band has travelled. The album is a rock opera of sorts combining Dungeons and Dragons imagery, wild tales of revenge and redemption, heroes at a crossroads and legends in decline. Sonically it melds together the REM inspired Athens, GA sound, outlaw country, and motorik meditations providing an engaging listen. “In League with Dragons” follows The Mountain Goats’ 2017 release “Goths”. In another departure for Darnielle and Co., the current album was produced by Owen Pallett instead of being self-produced by Darnielle. It was recorded at Blackbird Studios, Nashville, TN with returning bandmates; bassist Peter Hughes, multi-instrumentalist Matt Douglas, and drummer Jon Wurster, who is also renowned for his work with Bob Mould and Superchunk. The band called upon a number of studio contributors to flesh out the sonics. Robert Bailey contributed additional vocal arrangements and strings which were performed by the Macedonian Radio Symphony Orchestra to create organic and emotional motifs for a number of the selections. Darnielle has described “In League with Dragons” as a storytelling project set to music. He circles around the subject matter of rebellion against the fading of age, decay and break down. What results is a truly brilliant marriage of storytelling and inspired accompaniment. It is probably one of “The Mountain Goats” most approachable releases but still contains ample originality and quirk to satisfy longtime adherents of the band. The album begins with “Done Bleeding” which ponders society’s obsession with social conventions, the passing of time and the bittersweet irony of adulthood and middle age. This all takes place in an introspective daydream of sorts. The crystalline piano, insistent drum and throbbing bass all hit the right notes drawing in the listener to the content that will unspool. “Younger” is a phenomenal track loaded with cinematic wideness and there is a lot to unpack sonically, from the punchy lovely drums of Mr Wurster to the great sax solo at the outré. Throughout the song speaks to the feelings of being a stranger in a strange land utilizing Dungeons and Dragons terms and concepts. Songs like “Clemency for the Wizard King” and “Going Invisible 2” flesh out the D &D topic matter even further. As a contrast to the dreamy imaginations of the Dungeons and Dragons Noir found in many of the songs, the “Bandit Country” tracks of the album work as a counterbalance of stark reality. These songs look to channel the legendary bad boys of country music in their drug/alcohol induced haze. Specifically the songs; “Passaic 1975, In League with Dragons, Waylon Jennings Live!” are all excellent examples of Darnielle’s storytelling capabilities expressed in this manner. I predict that “Passaic 1975” will be a crowd pleaser when played live. Each of these songs depicts a fictional C/W musical artist on the skids, displaying the stresses and strains that change the artist into a shadow of what they once were. “Waylon Jennings Live!” captures the desperation and eternal hope of the roadside casino likening it to the desperation to become famous and the, even more, the desperate need to cling to fleeting fame. Putting aside the two conceptual threads that are sprinkled throughout the release, there are additional stellar tracks that demand attention. “Possum by Night” is a grandiose jazz piano track that harkens to Broadway and Joe Jackson’s wheelhouse. “Cadaver Sniffing Dog” is loaded with classic REM rock jangle that belies the sad narrative for the need to bring in these dogs when all hope is lost. The track is urgent and once again cinematic. “An Antidote for Strychnine” is stunning with its palpable desperation. This sombre track provides a narrator who has already taken the steps towards self-annihilation and is now attempting to turn back before death ensues. This world sore person only realizes that life is a gift when it just about too late. This is the “do not miss” track of the release and is heart rendering in its brokenness. However, The Mountain Goats do not sign off in despair instead “Sicilian Crest” ends on an upbeat, uptempo note as the finale instructing the listener to “hope for the best and prepare for the worst”, which is sage advice for handling our mad world.